What accounts for our longstanding fascination with the sea, with ships and with the siren call to distant destinations? 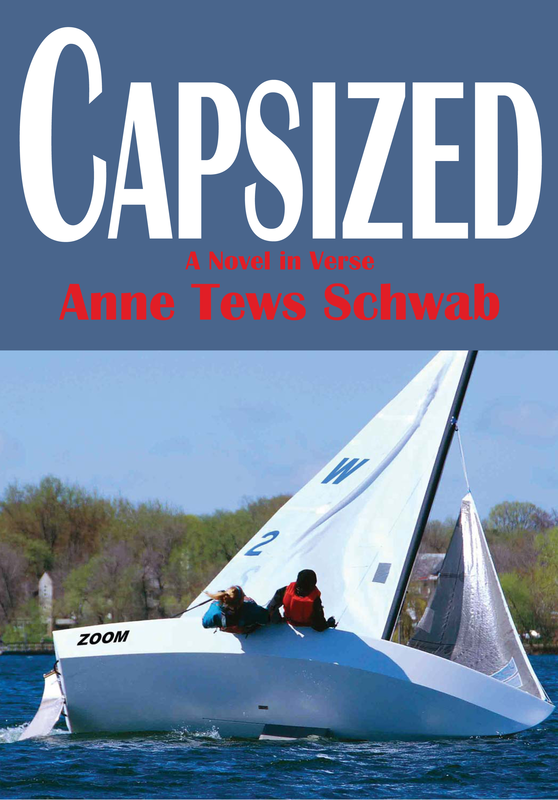 Anne Tews Schwab applies her own love of all things nautical to Capsized: A Novel In Verse – an imaginative story told in poems about sailing, music, family and swirling teenage emotion. Q: Let’s start with telling us how your personal journey as a writer began. A: My writing journey began at age three. I had recently mastered writing my first name, and was eager to share my writing prowess with my whole neighborhood. Red crayon clutched in my hand, I hurried outside and proceeded to write on the walls of the house, the door of the garage, the silver trash cans and the slats of our white picket fence. I was proud of my work but my mother seemed to disagree. Soon after my crayon masterpiece was discovered, I had my first experience in editing as my mother handed me a bucket and a sponge and instructed me to start scrubbing! Q: Were you a voracious reader growing up? A: Yes! We weren’t allowed to watch any television except for PBS, so my sisters and I all became voracious readers at very early ages. Q: What authors and titles especially resonate(d) with you (and why)? A: I read so many covers off so many books, I wouldn’t have the space to name them all here, but a few that come to mind include: The Anne of Green Gables series by L.M Montgomery (because my mother read a chapter out loud to me every night before bed), Cheaper by the Dozen by Frank B. Gilbreth and Ernestine Gilbreth Carey (because I dreamed of one day having a family as big as theirs), the Nancy Drew series by Carolyn Keene and Bobbsey Twin books by Laura Lee Hope and Harriet the Spy by Louise Fitzhugh (because I had dreams of one day becoming a detective or spy), A Wrinkle in Time by Madeleine L’Engle (because I wanted to be as smart as Meg and wanted to believe it possible to time travel). Q: What is Capsized about and what was your inspiration to write it? A: Written as a series of poems, Capsized is a fictionalized version of the some of the highs and lows and joys and woes of scow sailing and lake racing combined with a deep love of piano playing and music. Dani’s story began many years ago when I wrote a short story featuring a girl from a sailing-centric family who was deathly afraid of the water. Like Dani, I grew up sailing and playing piano, but unlike Dani, I loved the water, and my sailing and piano stories are quite different from hers! Q: Who is your target audience and what is the takeaway value you hope to achieve with those readers? A: I hope that young adult readers will emphasize with the plight of the main character as she struggles to balance the demands of her father, her mother, her brother and the friends that come and go in her life. In addition to empathizing with the story’s theme, I hope that teens and tweens will come away with a new found love and/or appreciation for power and beauty of poetry. Q: You describe Capsized as “a novel in verse.” What influenced your decision to go this particular route? A: As part of my MFA in Creative Writing for Children and Young Adults at Hamline University, I had the privilege of penning two theses – one critical, one creative. For my first thesis, I researched extensively in the field of poetry, focusing specifically on the epic poem and how it related to a novel of my own. As I dove deep into the epics of yore and was immersed in the world of verse, I had the lightbulb idea to rewrite a shelved prose novel entirely in poems. When the award-winning verse novelist, Ron Koertge, was assigned as my final semester advisor, I knew I had made the right choice. Q: What were some of the challenges you encountered in developing the story and its themes? A: The first challenge came when my advisor advised me to put the whole prose novel away, make a bare bones outline of the general story structure from scratch and then begin again, but this time in poetic format … Yikes! The next challenges arrived as I struggled to find the poetic forms that would best represent character, setting, action and emotion. Q: What part does setting play in the development and progression of the plot? A: Dani’s home lake — Black Bear Lake — plays a large part in her life and the lives of her friends and family. In addition to being essential to the sailing action that takes place in the story, the lake also sets the tone and pace of the poems and prose throughout the books. The rhythm of the winds and waves across the lake are reflected in the rhythmic development of the story and the ebb and flow style plot progression. Q: If you could be any character in the book, which one would it be? Q: If you were to set sail around the world with only one person for company, who would it be and why? Q: How long did this book take you to write from start to finish? A: If we count all of the prose drafts, plus the short story that began it all, the whole process adds up to nearly ten years. If we only count the poetic drafts, it would be closer to two. Q: Tell us a little about your writing process. For instance, do you do outlines and research in advance or create and research as you go along? A: I am more of a pantster than an outliner – I tend to write by the seat of my pants, letting the plot develop and the story grow until the first draft is done. After that, I will go back and outline the basic structure to find the holes, pinpoint the flaws and discover what more is needed. Q: What are some fun or interesting facts about Capsized you’d like readers to know? A: The sail number and name on the X boat pictured on the cover are the same as my boat’s name and number from back when I was an X-boat racing teenager, but that’s not me or my boat in the picture! Q: In classrooms across the country, the study of poetry has seriously fallen by the wayside. Further, aspiring writers are often discouraged from writing poetry because there just isn’t any money in it. What’s your reaction to this? A: It’s true, there is not a lot of money in poetry, but, as I tell teens today, poetry has a power that cannot be denied. With poetry, deep emotions can be expressed in non threatening ways. With poetry, teens can speak deep truths. I like to borrow the words of a certain wise doctor when I speak with teachers and teens and tweens of today about poetry, telling them that, with poetry in their pocket, “Oh, the Places You Will Go!” (apologies to Dr. Seuss). A: I submitted my book to a wide range of traditional publishers, but as a quiet verse novel, Capsized did not garner a strong interest from agents and/or publishing houses. After some careful research, I found North Star Press, a local publisher with strong poetry collections. Through their guided self-publishing arm, Polaris Publications, I was able to bring Dani’s story from manuscript form to published fruition. Q: What kinds of things are you doing to promote the book now that it’s out? A: Interviews, book signings, mailings, book club appearances, teaching classes about poetry, teaching online workshops, contacting schools and libraries. Q: For writers that are just starting out, what are your three best tidbits of advice? A: A middle grade fantasy fiction story about pirates and mermaids and destiny and family. Q: Anything else you’d like readers to know about you or your work? A: I write a poem a day and I would encourage all of your readers to do so as well — poetry is perfect for all people, all places, all the time. Poetry is perfect for you!